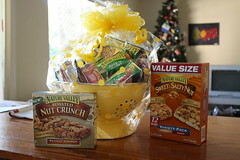 Lest you think with all this Klondike and Watermelon related goodness I have forgotten my friends at Nature Valley Granola bars, I thought I’d show you a pic of the gift basket they just sent me in preparation for my Antarctica trip on the 14th. The actual reason for this basket, however, isn’t just as a nice surprise – it’s because in the process of them assigning different eCompanies different parts of the “dealing with Joel” process, I was actually sent an extra check for $16,000+. 10 minutes of agonizing about whether I should just cash it and keep it left me feeling too guilty, so I called up and told them about their mistake. Maybe in another time or place I would have kept it, but I was waiting to find out about Klondike, and Karma-icly, I thought it would have been bad. Anyway, the best part of the gift basket is clearly the Fiber One bars – those things are phenomenal. But let it be a lesson to companies to stay on top of all their various out-sourcing agencies. Also in the mail today, I got my gigantic check shipped to me, which, unfortunately, looks a little sadder post-shipment than it originally did. But I’m still excited to hang (pieces of) it on my wall. Good for you! Your parents must have given you great values! Hi Joel, What fun to meet you at Phil’s wedding!! Have a great time on your trip. Hey, sometime I have to tell you about my game show winnings! !